Hey there, it is Jeanette, your friendly Veterinary Technician here to talk about lasers – Cold Laser Therapy that is. If you’ve brought your four-legged baby in for anything from a rash to arthritis or even a wound, we’ve probably recommended cold laser therapy. And you are probably wondering the why and the how laser therapy can help for all of these different conditions. I’ll try to keep this short and sweet and not go too Bill Nye the Science Guy on ya’ll. 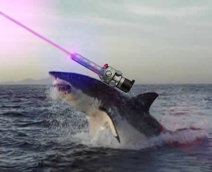 A laser is just an amplification of light. Cold Laser Therapy works on the cellular level by stimulating cells. When the probe is moved over the skin, it activates the cells into “hyper-drive” mode. The cells are attracted to the beam of light. The cells’ response to the light causes a cascade of events, which results in the reduction of pain and inflammation. This hyper-drive mode increases cellular energy, and increases cellular respiration, which has an analgesic (pain relief) effect. There is an increase in Beta-endorphins that are used as an analgesic in the body to numb or dull pain. Additionally, cold laser therapy causes an increase in Serotonin (a neurotransmitter thought to be a contributor to feelings of well-being and happiness). Furthermore, there is a decrease in bradykinin (an inflammatory-mediator- which is a cell-to-cell communicator). Histamine is one of the main chemicals released during inflammation. This causes the inflamed area to feel itchy which can lead to a pet overly licking that area and causing further damage which is called a lick granuloma, a skin disorder. This all means, you will see acceleration in both tissue and wound healing. Cold Laser Therapy promotes and advances healing and does not just treat the symptoms. Cold Laser Therapy increases regeneration of tissue that can reduce scarring and allows for a higher quality of life with pain management. PAZ Veterinary offers cold laser therapy for your companion pets! A session is usually about 10-30 minutes. If you are interested in more information or would like to determine whether laser therapy is a viable option for you and on the condition, feel free to give us a call!